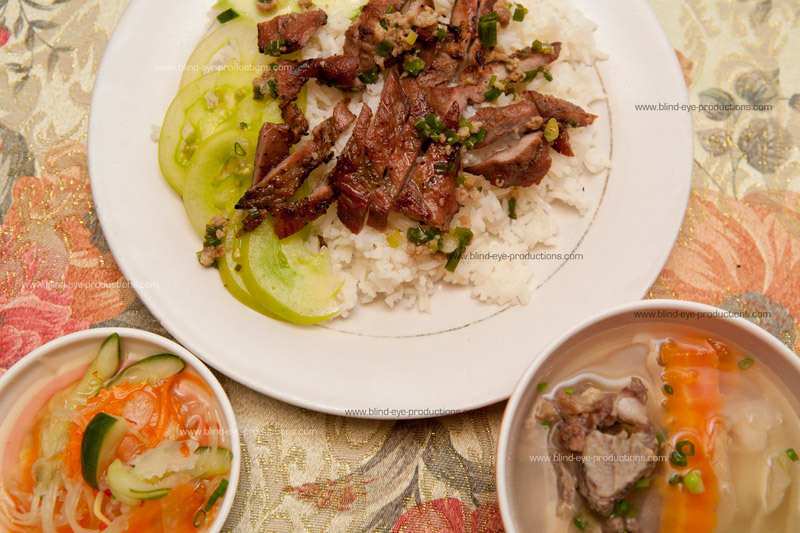 Bai Sych Crouk (Grilled pork and rice) is a great Cambodian dish and when done right, rivals Pho for my favorite breakfast dish of all time. 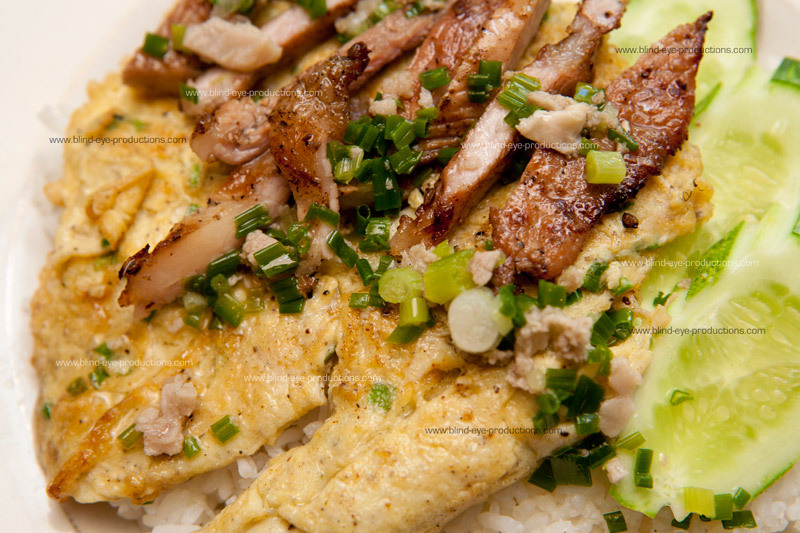 So what better place to try this dish than the place with the best grilled pork in town! Upon arriving at 7:30 in the morning, the first thing I realized is that it’s certainly not as busy for breakfast as for dinner. No waiting for a table here! We ordered two dishes initially. The pork and rice (4,000 Riel) along with some beef noodle soup (4,000 Riel). Never order the noodle soup. Ever. 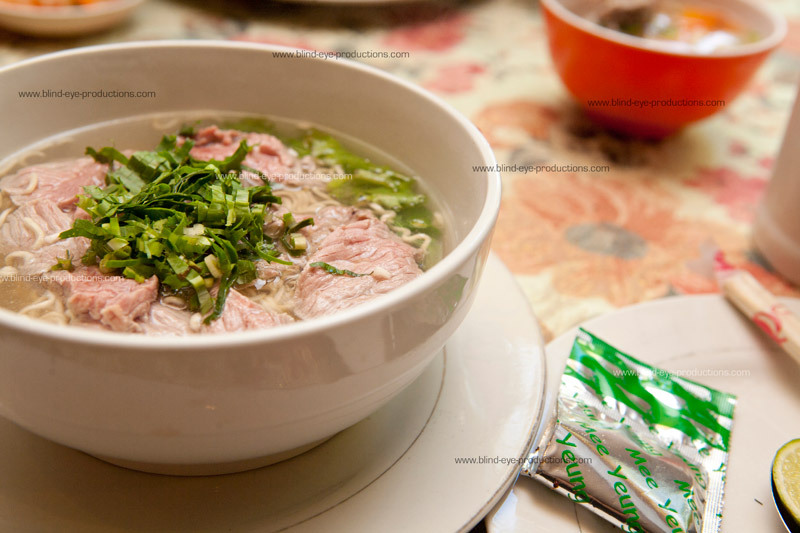 What you get is a packet of noodles immersed in some plain water with some sliced beef and herbs. They even give you the flavor packet on the side if you want to give your plain water a bit of oomph. I thought I had ordered it wrong and asked the waiter if this was khtieau and was told they didn’t have khtieau. More on this later. The pork and rice didn’t disappoint. The pork had a nice char on it and had that great marinade that you get from dinner. An added bonus was the flavorful soup broth on the side which had a nice piece of tender beef to gnaw on. Which makes me wonder why they didn’t use the broth for the noodle soup. 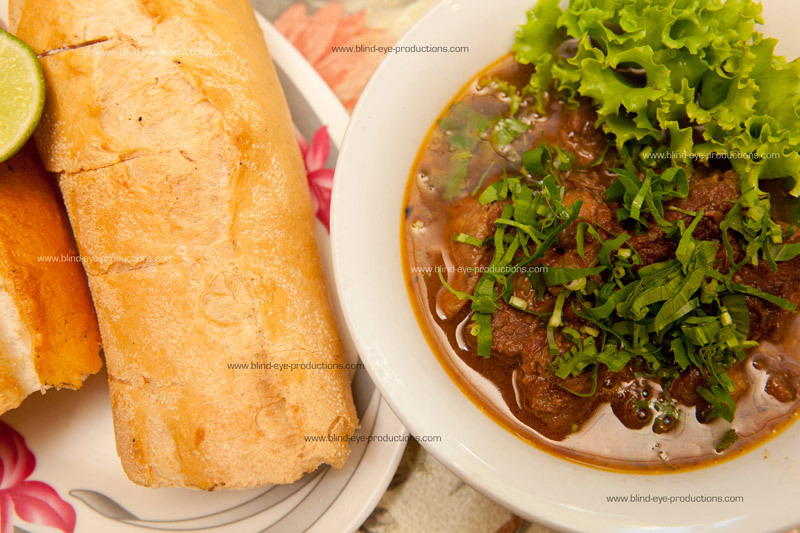 We also ordered a bowl of beef stew (5,000 Riel) which I spied at another table. The brothy stew had tender chunks of beef with onion and carrots filling it out. My order came with bread but you can also order it with clear noodles. Which also makes me wonder why they didn’t use the noodles for the noodle soup. The last dish we had came as a recommendation from a Nyam reader that eats at Sovana quite a bit. Called the Sleeping Cow (5,000 Riel), I’ve renamed it Sovana fajitas. 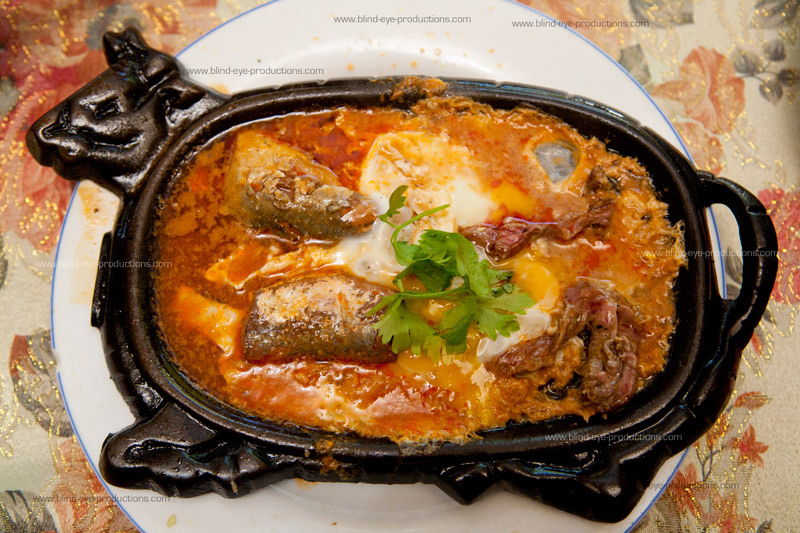 The plate comes to the table sizzling with a few bits of beef on one end and a couple pieces of fish in a tomato broth on the other. Separating the two was an egg that was still cooking when it arrived. One major problem I had with the dish was the out of the can tomato broth left a pretty nasty aftertaste. Certainly not my favorite. Like most Khmer restaurants, Sovana has no menu for breakfast. Somehow, everyone just know what to order. Which is fine but after we were sitting and enjoying our random guesses at what they would have, we saw a few other nice looking dishes come out so we decided to give it another go a couple of days later. Round one was ice coffee with sweet milk and white rice with grilled pork. While the iced coffee tasted like dirty water, the grilled pork was the best I’ve had for breakfast. I also tried a bit of the Sleeping Cow which was horrible and left a bad taste in my mouth all morning. But the other folks at the restaurant loved it and people were ordering it all over the place. 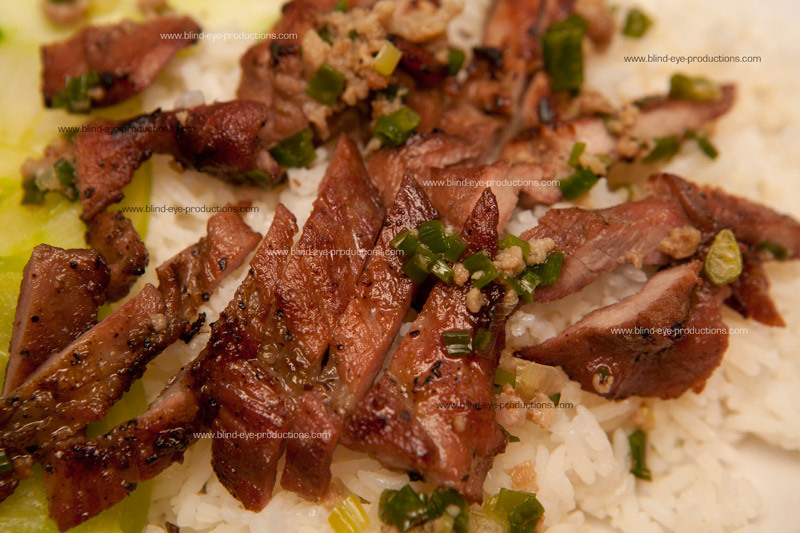 Another great article extolling the virtues of the humble pork and rice can be found on Phnomenon.